Extra money should be targeted at white working class pupils in England and Wales to help tackle low achievement, says a teachers' union. The National Union of Teachers says cash should be tied to poverty levels rather than race as some funds are now. The poorest white boys and girls are the lowest attaining group in England, save for gypsy and traveller children. Such white working class pupils needed "dedicated and specific attention", the union argues. School funding already takes account of the deprivation levels of the local area. But schools also get extra cash for a range of things including the number of pupils they have from ethnic minority groups, and those with English as an additional language, for example. This can amount to significant sums. 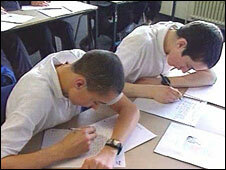 The NUT says the only group not offered specific extra support is white working class pupils. General secretary Christine Blower said: "Social class has the greatest effect on educational achievement. "It is still the case that how much your parents earn and the quality of their own education has the greatest influence on the achievement of their children." She added: "All over the country, job loss through the collapse of manufacturing has caused problems for working class communities. "The NUT is determined that those communities should not be prey to the poisonous attentions of racists and far right parties." An NUT policy paper, Opening Locked Doors, said the impact of social class on educational achievement had been given far too little attention by recent governments, and indeed by all parliamentary parties. "Just as the underachievement of black Caribbean boys and indeed groups such as Pakistani pupils need dedicated and specific attention so does the underachievement of white working class pupils," it added. The teachers' union is now calling for a new ring-fenced grant which covers all groups of young people in need of support, including white working class youngsters. This would recognise the shared experience of the working classes across different ethnic backgrounds. A similar ring-fenced grant should be available to schools that provide adult education and community learning classes for parents. The NUT also wants head teachers and teachers to be given training on social class issues. The government does not explicitly fund white working class boys and looked-after children through its general school grant, but it estimated that in 2006-7 10.5% of the £27bn paid to local authorities was targeted on deprivation. Within that, it was estimated that 1.8% was specifically targeted at black and minority groups with the remaining 8.6% on general deprivation. A spokesman for the Department for Children, Schools and Families said it targeted investment to the most deprived areas so schools facing the biggest challenges get the backing they need. "And we are already targeting children falling behind at school - that's we are legislating so all children and young people who need it will be guaranteed one-to-one tuition and catch up support in English and maths regardless of their social or ethnic background. "There is more to do but it is clear that the gap between free school meals and the national average is narrowing and that the most disadvantaged areas have seen the biggest improvements in the last decade."